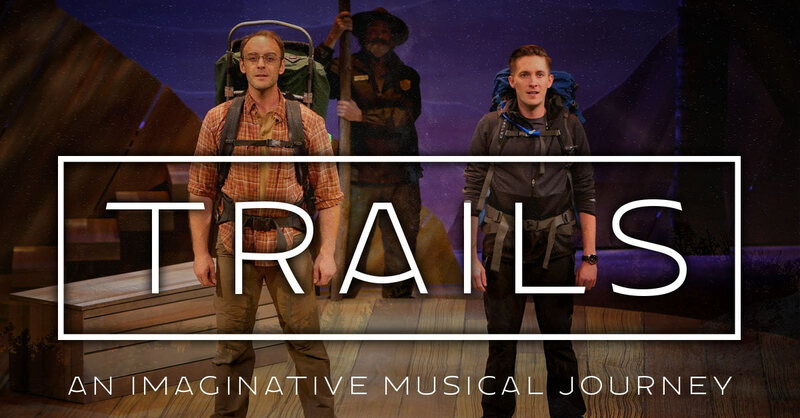 Captivating audiences with its deeply-moving and inventive tale of love and loyalty combined with an enchanting original score, Trails offers a profound exploration of the lengths we’ll go to keep from losing what we cherish the most. Runtime is approximately 1 hour and 45 minutes with no intermission. 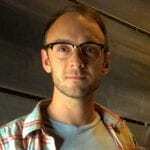 Joel Walker is a native of Portland and received his training at Marymount Manhattan College in NYC. 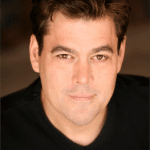 Previous credits with Broadway Rose include Company (Peter), Thoroughly Modern Millie (Jimmy Smith), and The Drowsy Chaperone (Robert Martin; Drammy Award). Joel is also a company member with Éowyn Emerald & Dancers (Edinburgh Fringe sellout, 2016) Upcoming: Holiday Inn, and Kiss Me Kate (5th Avenue Theatre). 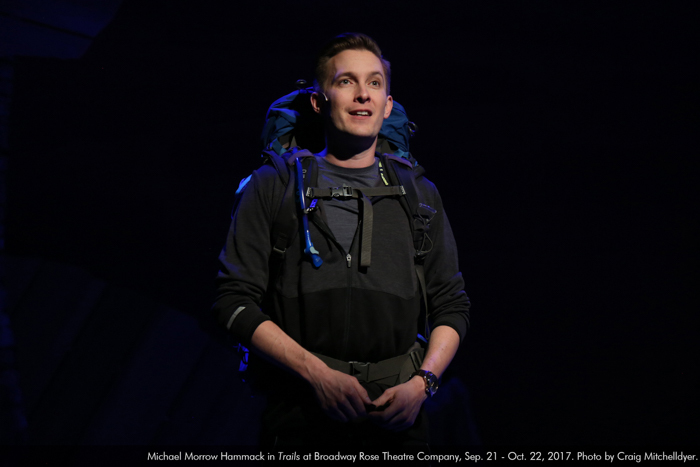 Michael Morrow Hammack is thrilled to be returning to the Broadway Rose stage where he was last seen as Mitch in Adrift in Macao. 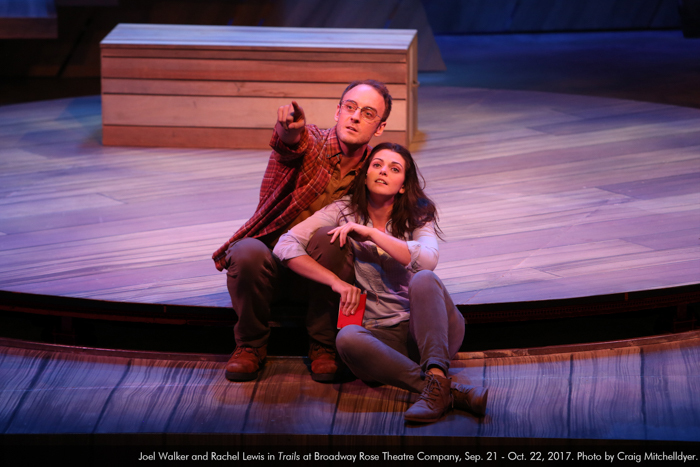 Other Portland credits include Frobisher/Thomas Jefferson/Winton/John Reed in Astoria: Part One at Portland Center Stage, and Fabrizzio in The Light in the Piazza with Portland Playhouse. 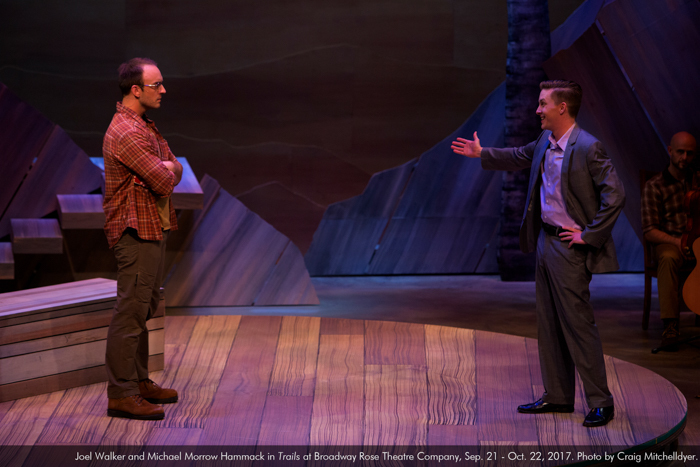 Just before returning home to Portland, Michael created the role of Telemachus in the world premiere of Crown of Shadows: The Wake of Odysseus at Roundhouse Theatre in Washington, DC. Favorite roles include Monty in Violet, Gayman in The Lucky Chance, Tim in Suburbia, and Peter in Sabrina Fair with Ford’s Theatre. 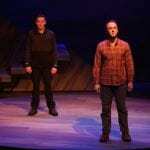 He holds a B.F.A in Musical Theatre from Webster University’s Conservatory of Theatre Arts. Rachel is stoked to play with Broadway Rose again this season. She was last seen as the Bride Ancestor in The Addams Family this summer. 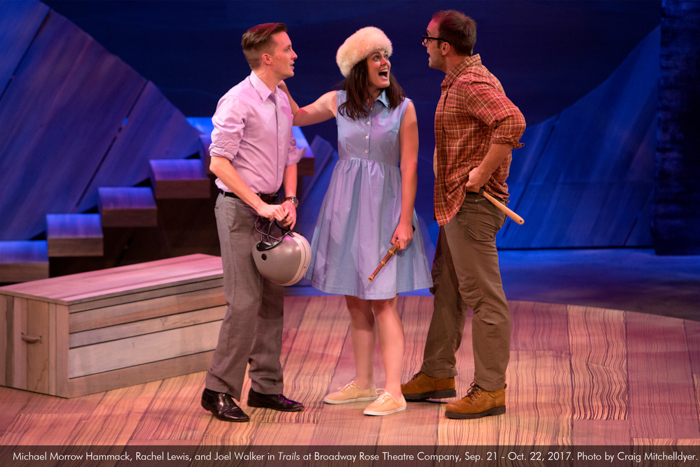 In June, Rachel completed an acting apprenticeship with The Portland Playhouse and is still riding the waves of inspiration sparked by her experience there. Rachel finds so much joy in making music; you may find her acoustic duets with Quinn on Instagram, and might see her singing with Broadway Rose alumni Ben Tissell this fall. A Florida girl at heart, Rachel is at home here on the west coast. Quinlan is thrilled to be making her Broadway Rose debut with Trails! Raised just outside of Los Angeles, she received her B.F.A. in acting and B.A. in communication from the University of California, Santa Barbara in June 2015. 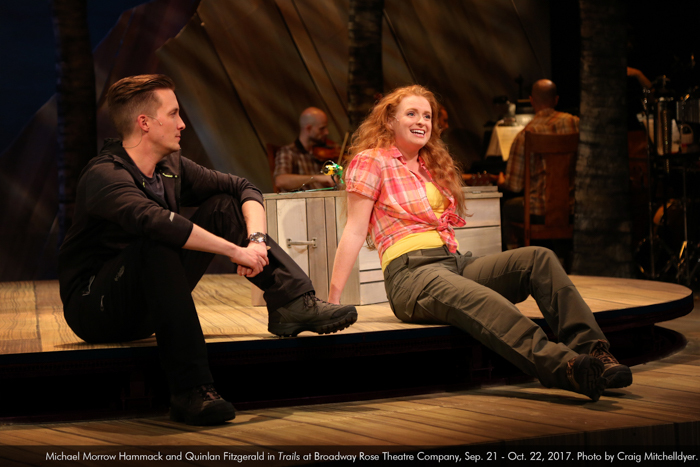 Shortly after graduation, she moved to Portland as a member of the Portland Playhouse 2015-2016 Acting Apprentice Company. Previous Portland Credits include: The Angry Brigade (Third Rail Repertory Theater), Charles Dickens' A Christmas Carol, Peter and the Starcatcher, You for Me for You (Portland Playhouse), Love's Labour's Lost (PAE). 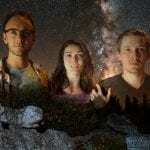 Danielle is honored to work with this wonderful cast and creative team. Some previous stage credits include Adrift in Macao (Broadway Rose), Urinetown (Anonymous Theatre Company), Davita's Harp (Jewish Theatre Collaborative), Bus Stop and Tartuffe--Born Again (Broadway Understudy, Circle in the Square Theatre), The Country Wife and Julius Caesar (Shakespeare Theatre of New Jersey), Much Ado About Nothing (Hamptons Shakespeare Festival), Oedipus (American Stage Company), 110 in the Shade (Stumptown). Film/TV: Zilla & Zoe (Independent Film), Grimm (NBC). Danielle is a graduate of the Circle in the Square Professional Theatre School, and Founder/Creative Director of The Reading Parlor, in Portland. 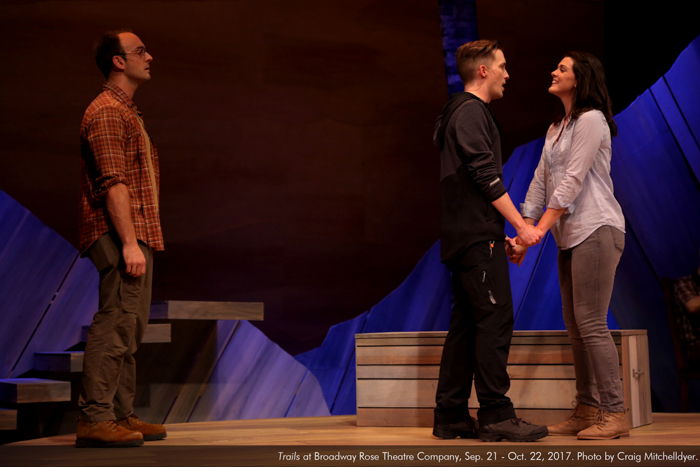 Kevin-Michael was last seen at Broadway Rose last summer as Erronius in A Funny Thing Happened on the Way to the Forum. Recently he was Major General Stanley in The Pirates of Penzance for Mock's Crest. 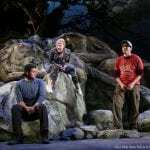 Kevin has been performing theatre locally and regionally for over thirty years. Highlights include: Inky in The Ghosts of Celilo (PAMTA, best supporting), Sam Byck in Assassins with ART, and Riff Raff in The Rocky Horror Show for triangle productions! Kevin toured nationally with the 3rd Floor Sketch Comedy Group, and can be seen on the little screens in Grimm and Portlandia, and on the big screen in Wild for Fox Spotlight Films. Kevin will reprise his role as Smee in Peter Pan at the Northwest Children's Theater in the Spring. 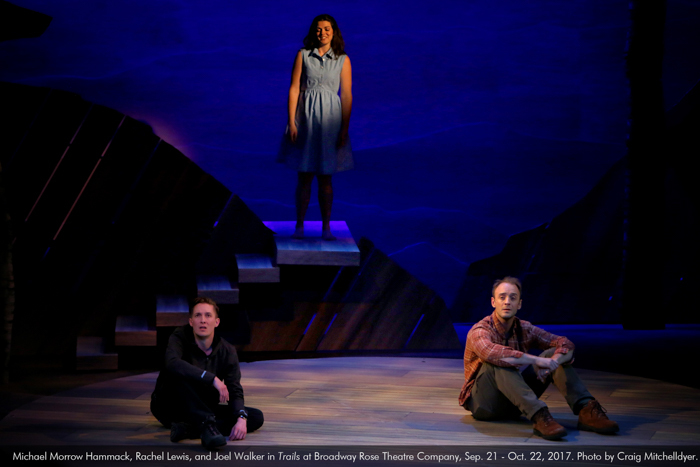 “Trails” has all the expected hallmarks of a Broadway Rose production: A surprisingly expansive set, given the intimacy of the theatre, a top-notch cast, and a solid band….Read more. 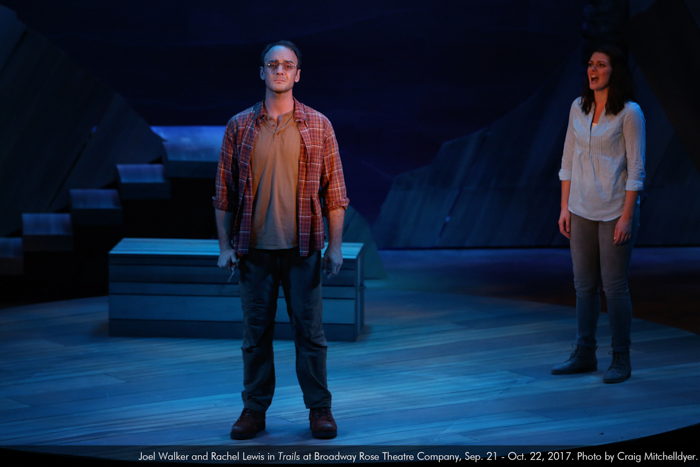 As always with Broadway Rose, the vocals, music, and arrangements are beautifully executed – the harmonies are elaborate and powerful, and the sometimes haunting, sometimes upbeat solos allow each character a full range of expression…Read more. The music, conducted by Eric Nordin, ranges from sweet to pleasantly atonal. The action takes place amid a splendidly simple set of raw boards and tree trunks (thank you Emily Wilken and crew! )...Read more. 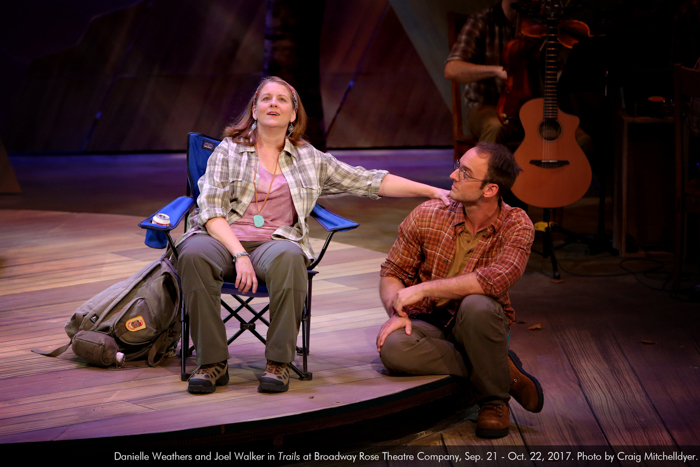 The Journey of a New Musical by Christy Hall, Jordan Mann, and Jeff Thomson Trails has been on a long and complicated journey, much like that of our two protagonists. 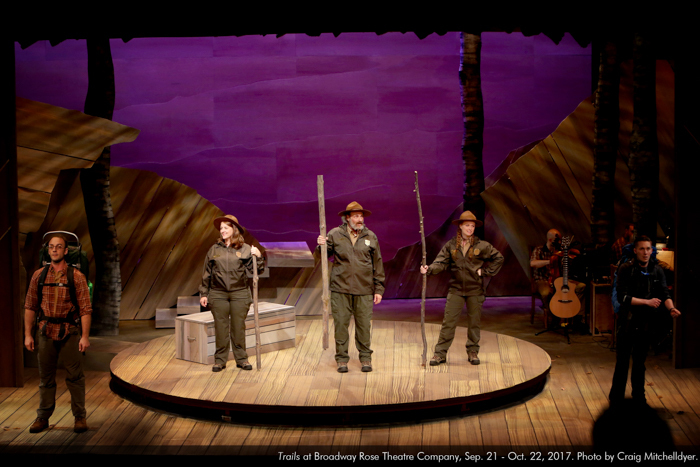 Now, we are excited for you to experience it here at the Broadway Rose as our musical continues on its way toward journey’s end… Read more. “I’m passionate about telling a story with music and action, and this is a cool experience,” Walker said. 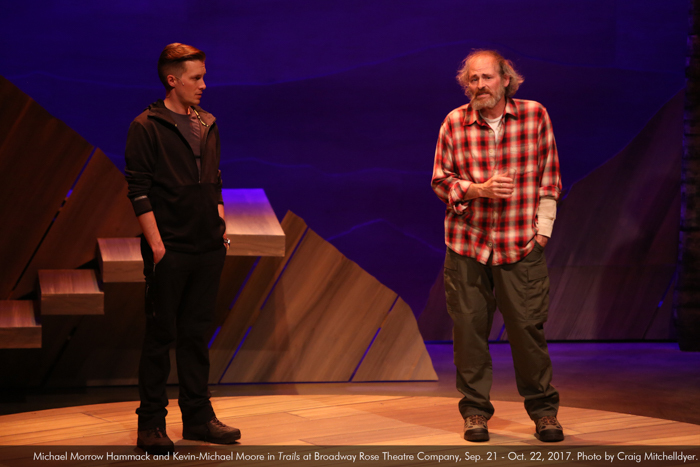 “…it’s nice to be working on brand-new material… It’s rare for an actor to have that opportunity.” Read more. 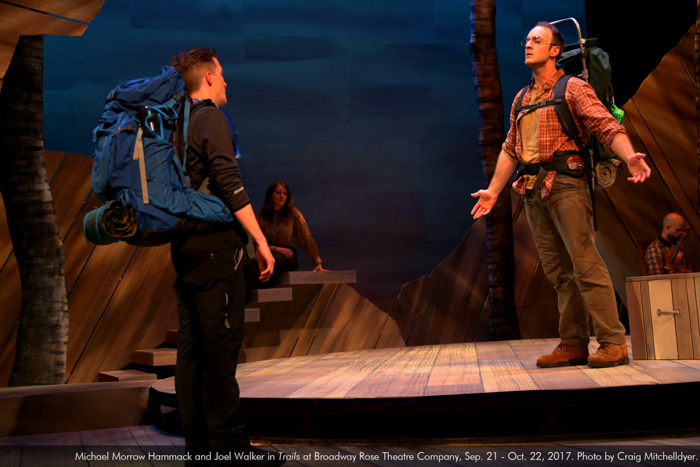 “As soon as the show was licensed for production, we immediately took it off our shortlist and put it in our upcoming season….” Read more. After reading the script for Trails, the first thing that came to mind – in terms of how to approach the material – was simplicity. 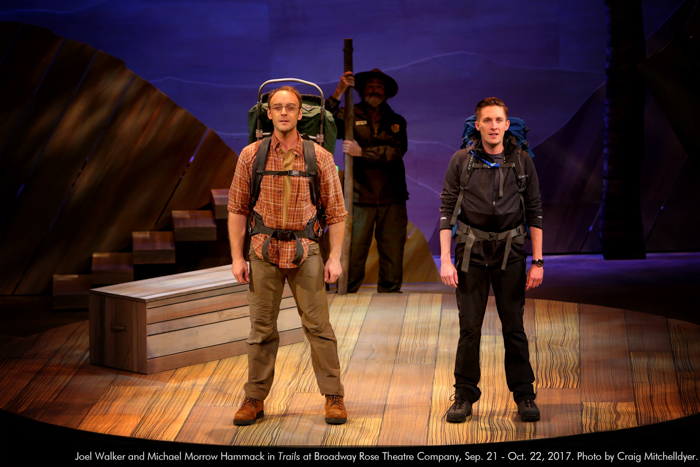 Here was a musical that took place on the Appalachian Trail, spanned decades, and had actors playing multiple roles. There were elaborate descriptions of the terrain, a Greek chorus of sorts, and on top of all that, the story jumped back and forth in time in the blink of an eye. 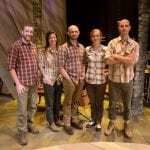 For me, this musical called out for a stripped down, less-is-more approach. Let the audience use their imaginations. Throughout the show, many of the actors play children, and as children we don’t need much when we pretend. A stick becomes a sword, a funny voice transforms us into a traveler from a far-off land, and by puffing out our chest we become a warrior. Children aren’t guarded, or self-aware enough to concern themselves with being perceived as ridiculous. That’s something that comes with growing older (and wiser?). We’re told to “grow up” and encouraged to push our feelings down. We put up barriers and muck life up with our need for more. Bigger is always better – which of course is not the case. We forget that sometimes the basics in life are all we need. I remind myself of that as we go forward in rehearsals. Strip everything down to what is essential and allow the story to be told as simply as possible. It usually brings out the most creative and honest work possible.